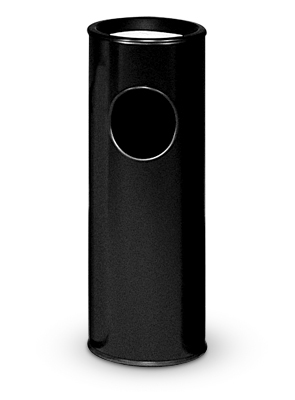 Black powder-coated steel, dual purpose trash receptacle and cigarette waste sand urn in one. Constructed of fire-safe steel. Protective vinyl trim encircles the 5.5" round disposal opening. The base is designed with a non-corrosive ring to prevent floors from scratching. Removable black anodized aluminum sand urn top with a mar proof epoxy finish resists cigarette burns and allows easy access to the included 3.5 gallon rigid plastic liner. White or black sand for cigarette urn sold separately.